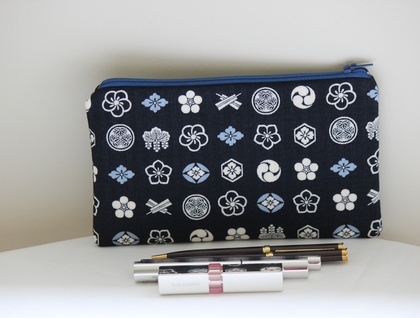 This Japanese fabric case is great for holding pens, make-up, accessories and all those small items. It measures approximately 21 x 13cm. 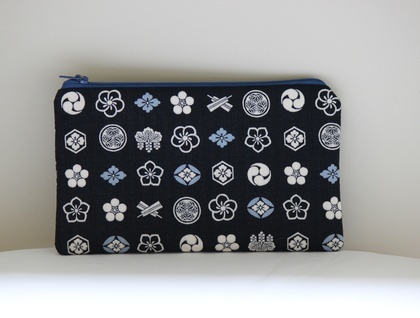 The fabric is very unique with print of mon (Japanese family emblem) on a navy background. It is 100% cotton with layers of interfacing and light wadding for softness and structure. 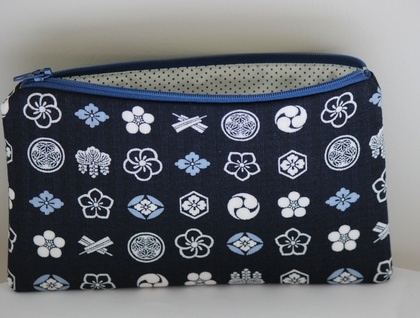 It is also lined internally with navy polka dots. Print placements may vary slightly. Hand made in a pet- and smoke-free environment. *If you buy more than one item I can combine shipping. Contact soleil to enquire about payment or shipping options.